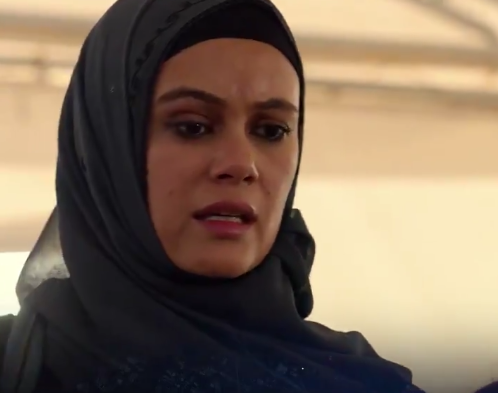 You might know Dina Shihabi from the hit TV series Tom Clancy’s Jack Ryan where she stars alongside John Krasinski, or the film Amira and Sam released in 2014, or from her appearances on CBS’s Madam Secretary and Saturday Night Live. No matter where you know her from, the familiar face of Shihabi has inarguably earned a spot in Hollywood, and is well on her way to making her mark in the industry, representing Arab actors on the big screen. Born in Riyadh to a Saudi father, Shihabi has been breaking the mold since she was seven years old when she took up dance while living in Dubai. Since then, she was accepted at Juilliard and NYU’s Tisch School for the Arts. Shihabi spoke to Al Arabiya English, and discussed her childhood in Saudi Arabia, how she landed her acting roles and how her Arab background helped her on her road to becoming a star actress. Tell us about your childhood, and what was it like growing up in Saudi Arabia? I was born in Riyadh and lived there till I was seven. I have really fond memories of that time. There is such a sense of community and family there that I am still friends with a lot of the kids I grew up with. One of them, Lara, who is now a chef in Dubai actually called me last night after watching Jack Ryan and we were crying on the phone together celebrating all of this. I remember watching Captain Majed and Full House. Seeing hail storms outside our window and on Fridays going to my great grandmother’s house and eating fassulya and mullekhia. At seven, we moved to Dubai and it felt like an entirely different world. I remember being quite shy and loving tennis. I was in ballet class and hated it. I thought it was really boring so when I was nine I quit ballet and started skateboarding and dressing like my older brother. Around that time, I remember I was put in the school musical because I was shy. Two years later, I was still in the school plays and enjoying it. Then I walked into my first street jazz dance class and everything changed. I fell in love with it. How have your Saudi roots shaped who you are as a successful actress today? I get to play incredible Arab roles like Hanin in JR and I am connected to incredible Arab filmmakers and artists that have such great stories that need to be told. We all get to be a part of sharing a voice that hasn’t had the chance to really be heard. I’m so excited for that. I feel super proud for being Arab. There is a passion that is in our blood that I feel really drives me. How did Hollywood receive you as an Arab/Saudi girl? Was it tough? I think everything has happened in the way that it was supposed to. I feel so lucky that I got to play Hanin and I wouldn’t have been able to play her if I wasn’t Arab. So yes, the opportunities for someone like me are limited but the gift of being from where I’m from is that I got to play an incredible beautiful and complex and powerful character and I get to bring stories that haven’t been told yet in mainstream media to life. Did you always know you wanted to be an actress? Or were you only focused on dance and the acting came later? I was always obsessed with film and TV. I just never thought I was good enough and dance was something that I excelled at quite quickly and had an incredible mentor for. When acting starting to present itself as an option it really felt like a natural thing. I never felt like I had to give up one thing for the other, the expression just morphed from dancing into acting. It feels the same to me, just in a different form. How did your parents react to your desire to be a dancer/actress? And how did they react when you told them about your first big gig? They were so supportive. My mother especially always knew that this was something that I was going to do. It took longer for my dad to get on board but once he was, he became so supportive. My parents have been amazing and so encouraging. I feel really lucky. They were so excited and happy for me. Giving them the good news that I booked Jack Ryan was such a good feeling. Do you feel a huge pressure/responsibility to represent Arab girls in a certain way in Hollywood? Do you feel like many of them look up to you? Sometimes. What I really feel pressure from is myself. I try and focus on being the best actor I can be and to serve the story in the most authentic and truthful way I can. With Hanin, I felt a huge responsibility to do whatever I could to humanize her and create an intimate and deep connection with her husband and her family. I knew that if I could honestly portray this woman as a mother and a wife who loved her family, that no matter where you were from you would be able to relate to her. I feel so honored that people would look up to me. I’m so excited for more people to go into the arts. There is so much talent in the region and I hope everyone feels inspired to do it in the way that is most genuine and exciting to them and to take risks and believe in the power of their own voice. I have been asked if I would ride a camel to school, and I said yes. What is it like working with John Krasinski and the cast of Jack Ryan? He is so kind, generous, supportive and encouraging. Working with him in a scene is the best experience because he is so giving and present. As a human being he is the loveliest and has been cheering me on from the second I met him till now. I have the utmost love and respect for him. Were you ever worried that some might perceive the series as a “typical American storyline” about how the US fights terrorism and saves the world yet again? Did you get those kind of critiques, especially as someone of Arab origin in the series, and how would you respond to that? Sure, that is always a fear but I knew from the reading the pilot script of Jack Ryan that this would be different. What Carlton and Graham created is really amazing. When you are an artist there is no way that you can please everyone. So what I find most important is that I believe in my choices and that my intentions are pure. Being an actor can be weird and messy because you have the job to portray a human being and I really take that seriously and don’t hold myself back from giving the character everything I have. Humans are complicated and the way each human being has to be revealed is unique and you have to serve that story completely. What’s your message to Saudi and Arab youth who aspire to break the mold so to speak and get into careers that may be looked at as “out of the box” in the region. A lot of the times Arab characters on American TV shows are one dimensional and not complicated but stereotypical. Luckily, Jack Ryan’s Arab storylines are nuanced and deeply complicated and as actors we got to really go there and as audiences watching I think you get an opportunity to really empathize and connect with them. What needs to happen next is that we are telling our own stories. That Arab writers, producers, directors, actors need more opportunities to put their own stories on Amazon, Netflix, HBO etc. So my message is share your stories. Get together with your friends and make a short film and submit it to festivals. There is a great need for you. Go for it. The time is now and don’t hold yourself back. Tell the complicated, weird, hurtful, hopeful magical story that has happened to you or that you dream about. We want it all. We need to show the world that we are more than what they think they know. We deserve our stories to be shared and our inner life to be seen. Be bold. Be brave. If something is scaring you, you’re on the right track. I can’t wait to see the magic you all create.